When I arrived in South Africa I knew that I wanted to do a road trip across the country. As my first foray into the African continent, I was sure it would be different than Asia where I’d spent the previous three years of my life, easily hopping from place to place on a motorbike or one of the many buses. South Africa wasn’t going to be as simple without plentiful public transport and easy local options, so a road trip seemed like the perfect way to take it all in. Self driving in South Africa is cheap and easy, and the most convenient option, IMHO. You can pay for services like Baz Bus, but once they drop you off, it gets hard to explore the area without wheels. If you share a rental with one or more other people, it works out cheaper and gives you so much more flexibility! If you’re looking for the right car rental, click here to compare options. For the most part, you can go cheap with the car. I’ve rented a VW Golf and a Ford Fiesta and both were fine. Apart from potholes, most of the roads in South Africa are easy to traverse with a cheap, small car, including Kruger National Park. You don’t need a 4×4, unless you’re heading truly off the beaten path. Additionally, I highly recommend getting a Vodacom SIM card when you arrive at the airport. It will help tremendously with navigating. Plus, WiFi in South Africa can be hard to come by. Finally, don’t forget travel insurance when you’re in South Africa! I love the World Nomads explorer plan which covers hiking and other adventurous activities. Johannesburg is a great starting point for a road trip and with its rich history and the Apartheid Museum, a helpful introduction to South African culture. What I really loved about it was the openness and friendly nature of the locals, who are quite likely to invite you to hang out again and again. I love the vibe of this city. It’s easy to talk to people there and it’s a welcoming place. I might be the only person in the world who prefers Joburg to Cape Town, but Johannesburg has a soul that I really enjoy. Plus, if you’re there over a weekend, you can find wonderful markets full of friendly and outgoing people. If you have the time, I also recommend exploring Soweto, the biggest South African township. *Remember to be careful in the big cities in South Africa, though. Don’t walk around, especially at night, and don’t leave anything at all, even if it’s a cheap pair of sunglasses, visible in the car. Lay your head: I’d suggest an AirBnB rental. A few years ago, a local South African let me in on a beautiful secret: Horseshoe Bend had a love child with the Drakensberg and it’s called Blyde River Canyon. Exploring the hiking trails, God’s Window, the Three Rondavels, and Mac Mac Falls all along the Panoramic Route can easily take up a full week in and of themselves, but if you are just looking for a stop on the way to Kruger National Park, stay near the Three Rondavels viewpoint to get this fantastic view. I will forever remember the way a rhino looks when he runs – so silly! It took me four visits back to South Africa to realize this, but if you don’t go to Kruger National Park you’re missing out! It’s so much fun to be able to go through a safari destination with paved roads and to be able to self drive. The best part was this could all be done with a tiny sedan! I know they’re murderous but Hyenas are so dang cute! After being on safari in Etosha National Park, all throughout Botswana, Zambia, and the Serengeti, Kruger might actually be my favorite! There are a few other places where you can see the big five (Lions, leopards, buffalo, rhino, and elephants), all in the same day. There are also hippos, giraffes, zebras, lots of impala, honey badgers, genets, loads of birds, and tons of other animals I’m forgetting. To supplement your self drive, I highly recommend signing up for the night drives which you can book at your accommodation. Since the park is huge, I suggest entering at Timbavati, staying one night at Olifants, and then making your way down to Lower Sabie before heading out to Golden Gate Highlands. Be sure to go grocery shopping either in Johannesburg or Hoedspruit before heading in so that you can cook your own food at the self-contained bungalows. Golden Gate Highlands is known for the sunset reflection on the gorgeous rocks, painting them gold. This must not be a place that many tourists visit because I didn’t see anyone else on the Wodehouse trail and our hostel was empty. If one were to stay in the nearby town of Clarens, surely there would be more people around, but it felt a bit too touristy to me and staying in the town of Kestell was way more fun! It’s one of those small towns that doesn’t even have a traffic light. If you do stay there, check out the only pub in town for some great conversation and a quirky crowd (meant in the best way). The park itself is ideal for some seriously impressive vistas, wild animal sightings (think zebras, ostriches, wildebeest, kudus), and the sunset. Lay your head: Karma Backpackers. It felt so cozy since it was in someone’s home, and I loved her dogs. 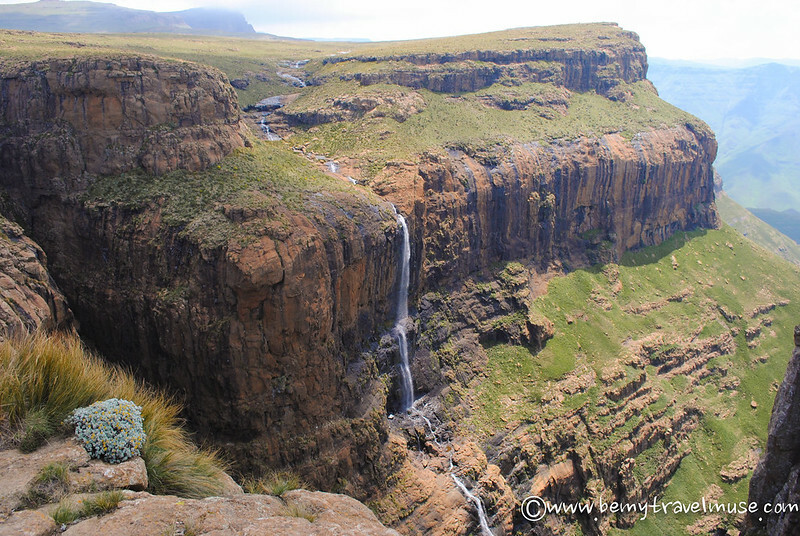 Waking up early in the morning and heading out to the Amphitheater hike at the top of the Drakensberg mountain range, a UNESCO World Heritage Site, it’s yet another gorgeous, 4-5 hour hike that will take you to the second-tallest waterfall in the world. Say hi to the horsemen from Lesotho at the top (who will most likely try to be a bit intimidating at first and ask for money, but will relent once you laugh it off and say you don’t have anything to share), run around the plateau, through the mist and along the rivers, and spend an hour or two at the top of the world. From there it’s an easy drive to the middle of the park where you can choose between the Cascades, Rainbow Gorge, and Cathedral hikes before heading out for a long 8-hour drive the following day. If you can spend more time in the mountains and do a trek spanning a few days, definitely do so. I wish we’d had time for that! Click here for more on how to prioritize if you’re short on time. Lay your head: Amphitheater Backpackers, it’s well-situated for the rest of the popular hikes in the area. The Transkei might be my favorite part of South Africa. 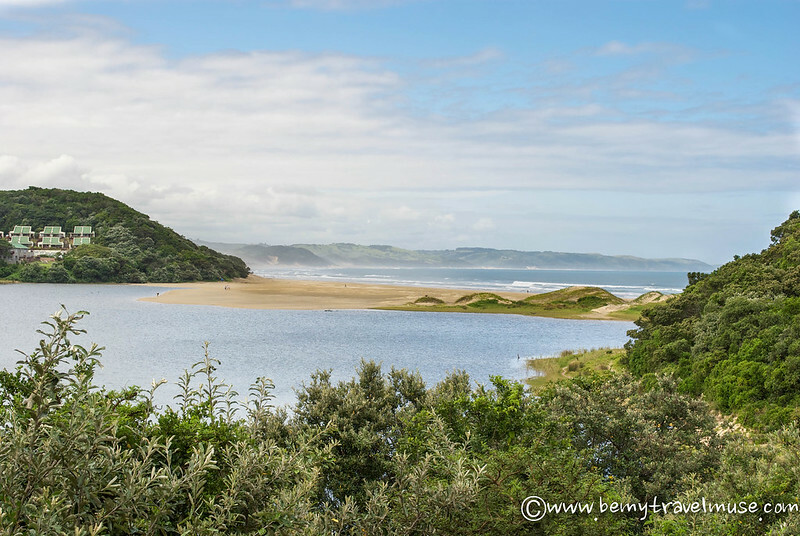 Also known as the Wild Coast, this part of the Eastern Cape was absolutely perfect for skipping the makeup, going on walks with adventures in every direction, and becoming one with the jungly beauty. Many travelers, locals and foreigners alike, go to Coffee Bay on the Wild Coast as it’s a gorgeous place to hang out and there are plenty of other backpackers around. The hike along the coast from Coffee Bay to the Hole in the Wall is mind-blowing as well, as is the hike in the other direction to Mdumbi. I know I keep saying that everything in South Africa is ‘gorgeous,’ ‘mind-blowing,’ ‘incredible,’ and many other colorful adjectives, but that’s because it really is! I couldn’t believe how blown away I was by the landscape, especially given what I’ve seen elsewhere in the world. Almost nothing rivals this place. This is a long drive from the Drakensberg. Apart from stopping in a township along the way for some street BBQ, which we did a lot during our trip and I can’t recommend enough, the day was mostly spent powering through and avoiding potholes. Lay your head: I stayed at Coffee Shack but wasn’t that impressed. Staff wasn’t friendly and the vibe was a bit off. I liked the atmosphere more at Sugarloaf Backpackers just down the road. A 4-5 hour hike away, Mdumbi is also a wonderful place with a great backpackers. Another gorgeous beach destination, Cintsa has idyllic waters and great cultural interaction opportunities, especially through Buccaneers, the backpackers there. One of the only Fair Trade certified establishments in South Africa, they give a lot back to the local community and bring in experienced volunteers and medical experts to provide assistance in the local township. I loved staying there knowing that in good conscience I was supporting a place that gives so much back. Just by laying on the beach and enjoying their gorgeous ensuite accommodation (with the above view! ), I was helping in a small way, too. One could spend days or even weeks surfing, going for long walks, and swimming in the gorgeous waters in Cintsa. Lay your head: Offering a range from backpacker and tent accommodation to the more upscale but still affordable ensuite and family options, Buccaneers is the best possible choice. 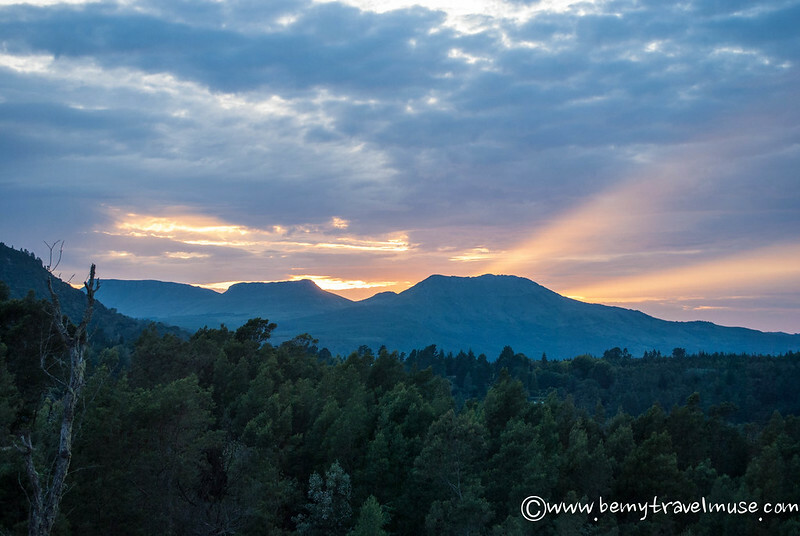 While at Coffee Bay a local yogi I met highly recommended staying at a permaculture farm in Hogsback. I’m so glad that we listened, because it was a wonderful place, a little slice of paradise. At first it reminded me a bit of hiking in Northern California. Until, while resting at a waterfall, a butterfly the size of my head flittered by, Callum unsuccessfully tried to pull a Tarzan on a jungle vine, and I heard baboons barking in the distance. This area is known for sightings of fairies and woodland creatures. After seeing the huge, bright dragonflies and butterflies that, from a side angle, really did look like fairies, I can agree. Spending a week here unplugged would be magical. Lay your head: Terra Khaya, the permaculture farm, is wonderful. I met such interesting people there, loved the communal meals, and really respect that the farm runs entirely off the grid, operating on solar power. The dorms felt so clean and free of insects, the private rooms looked pretty cool, and the outdoor shower was one of my favorite showers I’ve ever taken. Ever. I absolutely love this place. Most people would probably skip it or just pass right through, but it’s such a nice deviation and lesser-known alternative to the touristy Garden Route. Take a look at my nearly-poetic love for this place in this post so you can see, and feel, what I mean. Do yourself a favor and do stop here. Seriously. It’s so wild, so spacious, and so serene all at the same time. Deserts are special that way. Lay your head: The Rest Farm holds a special place in my heart. It’s great for lounging or volunteering in exchange for room and board. In the coming months various workshops will be taking place there, too. Nature’s Valley, an introduction to the Garden Route, was unfortunately a quick pass-through for us but one that won’t soon be forgotten. There are several hikes in the area that I wish I’d had a chance to check out. Top-of-the-list went to bungee jumping at Bloukrans Bridge, which is the highest natural bungee jump in the world. Lay your head: The guesthouse here, Wild Spirit, is seriously cool. It has a treehouse, drum circle area (with hula hoops because those are important, too), piano room, and a deck with a beautiful view. Nearby, there’s a dairy which produces nearly all of its own products (or sources locally), and serves a delicious and cheap breakfast. Unfortunately, because I wanted to love everything about this place, I hate to say that the dorms left a bit to be desired. They felt too cramped and old. I’d go for a private room or the campgrounds instead next time. Once you hit Wilderness, you’ll know you’re in the Western Cape. The circular huts of the eastern part of the country fade and make way for picture-perfect beachfront cottages. It’s not that one is better than the other, though I missed the rugged style of the east. To each her own, right? The sunset here wasn’t the typical orangey-pink sherbet sunset I’d normally think of to characterize a spectacular sunset. Rather, it consisted of wispy clouds, purple, periwinkle, and soft blues. The sky seemed massive that day over an expansive beach and the sun appeared to take hours to set. The day just didn’t want to end, it seemed. The waves on the sand mirrored the sky perfectly in a blurple (that would be, blue + purple) explosion. It was poetic. The birthplace of Pinotage is a must-stop for at least a day or two on your way into Cape Town. It reminded me of a cheaper, more laid back version of wine country in California, and with better wine, if I’m honest. Take a bicycle tour from winery to winery, mix your own blend, and try a chocolate wine pairing. For more on how to enjoy Stellenbosch to the fullest, check out my guide. Cape Town is the place of models and movie stars, glittering frigid waters and a tourist favorite. The way Table Mountain rises like a towering giant in the middle of the city – as if life gathered and grew around it – is unlike anything I’ve ever seen. Outdoorsy types have an almost limitless amount of adventures to experience here, from day hikes to multi-day treks, various water sports, kite-boarding, diving, and shark encounters. I admit this is the most beautiful city I’ve ever been to, with funky neighborhoods such as Woodstock, and posh beachside neighborhoods such as Camps Bay. If you’re staying for a while, read our full listing of things to do in Cape Town. Lay your head: I’d suggest an AirBnB rental which provided a better value than hostels in Cape Town. The map below has most of the stops mentioned in this post. Click ‘more options’ below under ‘Cape Town’ to open up the map in your browser and make changes as desired. While this itinerary certainly doesn’t exhaust the options, it’s perfect for a 2-3 week jaunt through the country seeing the highlights – both the better and lesser-known ones. Get ready for an incredible introduction to one of the best adventures in Africa. *Some links in this post are affiliate links to companies we use or hotels we have stayed at. Any bookings you make through these links support this site at no extra cost to you. Happy travels! You’re making me want to go to South Africa now! South Africa is a dream of mine and has been for years, and this has just confirmed every reason why I want to go so much. Beautiful photos! I will get there one day. Ah, this looks AMAZING! South Africa is on my list of places to visit, I think I would absolutely fall in love with it. PS: Bungee jumping looks so scary! Holy Cannoli! These pictures are beyond amazing. I haven’t dived into Africa much myself yet, but South Africa keeps getting pushed higher on the list. And SO good to know it is roadtrip-able. I want to see all of these places! This is what travel blogs are for! Thank you! That Wild Coast though!! It looks like an incredible road trip. It’s my favorite part. Loved it so much there. What a great itinerary. You have seen some amazing places, I love the pictures. Hey Kristin! Just discovered your blog, I am obsessed! I follow a lot of travel blogs out there and I am an avid traveler myself, but all your experiences are dreamy and I love your writing 🙂 I am heading to SE Asia for 2 months at the end of the year and wrote down a lot of ideas inspired by your experiences. I am not even in Asia yet and I am already thinking about my next trip (of course ;)) and going to South Africa has been a long time dream of mine. However I never thought that I could transform it into a road trip! Love the idea!! I believe someone else in the comments asked you for the approximate cost of this trip, I’d be curious to know too if you don’t mind…. That’s great, Coralie! I did go on Safari later in Namibia, Botswana, and Zambia. I don’t care if that kind of thing is touristy. It’s worth it! I did a 35-day overland safari and that included tons of animal stuff. It was a camping trip so basic but so much fun. Lots and lots of blog posts to come on that. Ah, I’ve been interested in South Africa for a while and your post has made me wanna go even more! Definitely included in my to-go list now. God, I can’t wait to get to South Africa. Your journey looks absolutely fantastic, and I’ll definitely be using your post as reference when I go there myself. I have the added benefit of having a lot of family down there to stay with and show me around, but the data you give is so much more useful, as it is from the point of view of a solo traveler, which is exactly what I am. So great you have family there! You’ll meet lots of folks along the way too, no doubt. Kristin, are going to the Skeleton Coast? I’ve always wanted to go. It looks AMAZING, not to mention not the morm, and I know you love the beach. I did briefly but upon my SA return I’ll spend more time there for sure. Have you done a post on security of personal belongings by any chance? Or are us novices unnecessarily paranoid about this aspect of travel? Specifically to South Africa I have one written but not yet published. It’s to come! Nice looking forward to it! fantastic read. Glad to see you managed to delve into more than just the Garden Route. I’m a South African myself, but I’m busy trekking around on the other side of the globe. Thanks for doing it justice and enticing others to come give SA a visit. Hope you got a chance to check out Kruger or Addo Elephant Park. It’s such a big and amazing country and I am so privileged to have seen what else it has to offer. You have the perfect itinerary for my taste, but sadly we will only have 6 days to follow the same route. I understand that we will spend a good chunk of the day in the car but as long as the scenery is beautiful, i am ok with it. What is your opinion. Would it be doable? If i calculate well, it would be 5 hours driving per day. Is that accurate? Hey Agnes – definitely more than 5 hours per day. We had a few 9-hour days and we had double the amount of time. It pains me to say this but maybe cut out coffee Bay and the Karoo. I loved them the most but the road into CB is very slow and bad and the Karoo and even hogsback take you off the main road which will eat into your time. You’ll still get a nice garden route trip that way which is beautiful. I’m sure you have done your roadtrip already and loved it but to others who want to know more about travelling South Africa in six days, here are some tips. 6 days is well possible. I would suggest starting in Joburg and heading down towards Port Elizabeth via Bloemfontein; along the way enjoy the Klein Karoo and the Orange River (by camping on it). 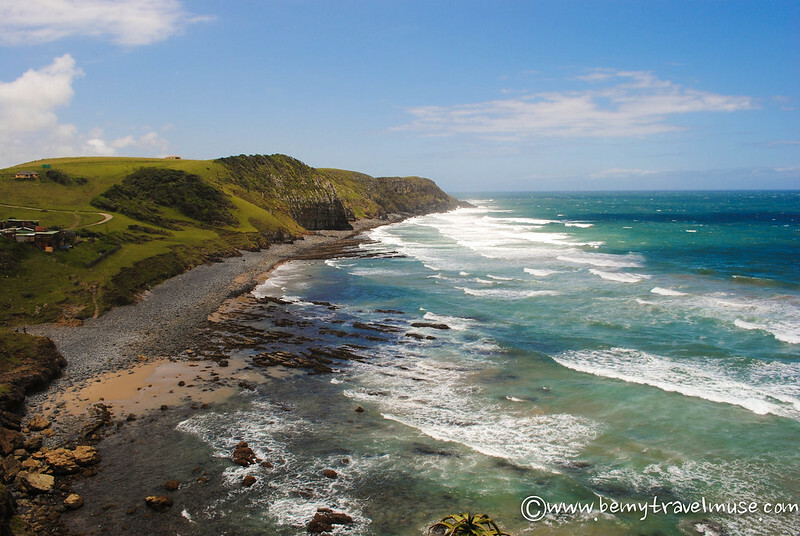 As Kristin says you will miss out on the heart of Transkei, which is beautiful, but unfortunately such is life that you can not digest it all. In going the route I picked you can stop in at beautiful little towns in the Eastern Cape that straddle the Transkei for eg. Nieu-Bethesda. This little gem in the heart of the Eastern Cape will warm your heart and it will need to – in winter it is really cold! As Kristin says you can then take the garden route towards Cape Town, which can be enjoyed in zig zags too – Patensie and other Klein Karoo towns can be visited by darting inwards and then back outwards towards the coast. On the way, you can also enjoy the southern most point of Africa, Knysna, wine and ostrich farms and an awesomeness of landscapes that will leave you dizzy. Remember to take the Outeniqua pass from George to Oudtshoorn (where my family is from). Landscape here dries out pretty quickly – and coastal jungle will become a dessert in just a few kms. Research some of the towns along the way here. You will not be disappointed. As I said, 6 days is well possible. The route I have shared is no more that 2000 km and that is easy to enjoy in that amount of time. I second the suggestion to spend more time in the Karoo and I loved Neiu Bethesda as well. I might even suggest heading down to the coast in the Transkei and skipping the garden route altogether. People say they like it because it’s ‘so European’ but that’s exactly what turned me off. I didn’t travel all the way to Africa to be reminded of Europe! Hi Kristin! I loved reading your story! I am planning to go to South Africa in Jan. From Canada and currently living in Seoul, Korea. May I ask you how long you’ve travelled in SA and the approximate cost for the whole trip there. I follow your blog and snap posts for months and always enjoy them!! Zascha asked you in a comment about the cost of your trip. If you still have the detail of it, could you email it to me please? And also, what was the duration of your trip?? I’m going there in May, and buying my tickets tomorrow, so excited!! Hello! I just discovered your blog after I booked a flight to SA for August. I had tentative plans to make it down to Cape Town and back to Johannesburg, but now I’m definitely inspired to road trip. I’ll be going alone because I couldn’t find anyone else to embark on the adventure with me. I’m curious about the days you traveled the longest. Were you concerned about driving after dark when going from place to place? Some distances look rather long and since I’ll be alone, I’m more wary of night driving in isolated places. Any advice would be great! Hey Christie, I think you’ll be able to meet people at the backpackers who will want to join you. I did that plenty and met others who also hitched rides from place to place. It’ll help you share the driving load and gas! I wouldn’t recommend driving at night if you can avoid it. I did a few times right at the end of the drive just as I was about to get to where I was going. Sometimes you can’t avoid it but do take extra precautions in Cape Town and Joburg. Have fun! I’ve found that South Africa is a really beautiful country that gets an undeserved bad reputation as being dangerous. Parts of it definitely are, but not the whole country! Great write up Kristin, very accurate information. I am a Saffer too and personally I am glad we have a reputation as a dangerous country. The result is we get quality travellers that want to see our country. Thanks for posting a really good blog post. True, the difficulty of traveling in a lot of the places in Africa in general is what keeps it lesser-visited and I think that makes a lot of difference! Kristin – this post was shared by a friend of mine and we’re thinking of doing this trip in December! I tried to sift through most of the comments above, but how many days did you spend on the actual road trip from Jburg to Cape Town?? We have about 11 days scheduled for South Africa (nothing compared to 9 weeks and someday I hope to extend my vacation time). I see that you spent up to 9 hours/day driving…with the hikes included, how many days would you allow for this itinerary?? If we had to cut out a few stops, I see Coffee Bay was one of them. Which others would you suggest?? Thanks so much for posting this! I’m also debating an 8 hour drive (coming from Lesotho) to get to Coffee Bay, it was worth it, right? Did you spend a night in each place? I’m curious on if you just flew through, staying a night each place along the way, seeing things are you drove, or did you dedicate multiple nights? I’m debating between a night in various places along the way, or fewer stops with more time in each. It’s hard to decide where since as you put it, everything is gorgeous!! I think it’s worth it. I stayed for two nights in Coffee Bay and breezed through some other places. More time for the trip would have been awesome but that’s not always possible, right? Decide where to stay longer as you go – that’s my advice. Totally know how it is. I think that’s a good buffer. Looks awesome. 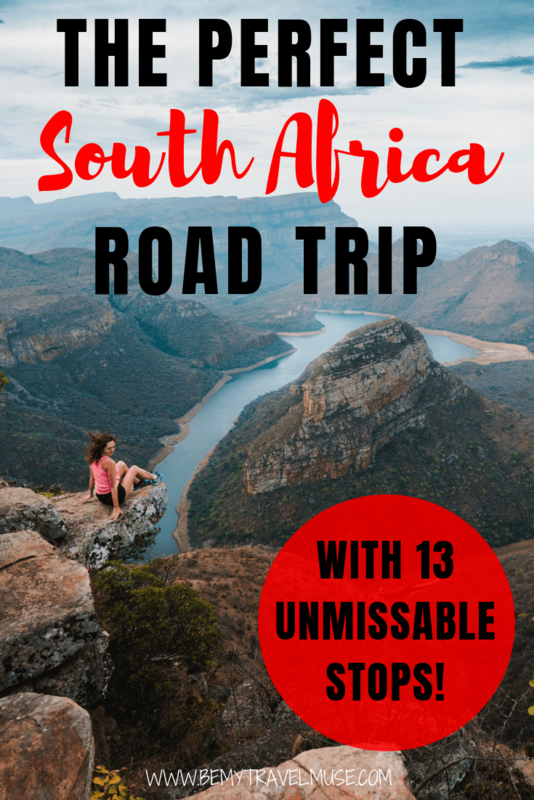 We are starting to think about doing a SA road trip and will definitely plan on making some of these stops. 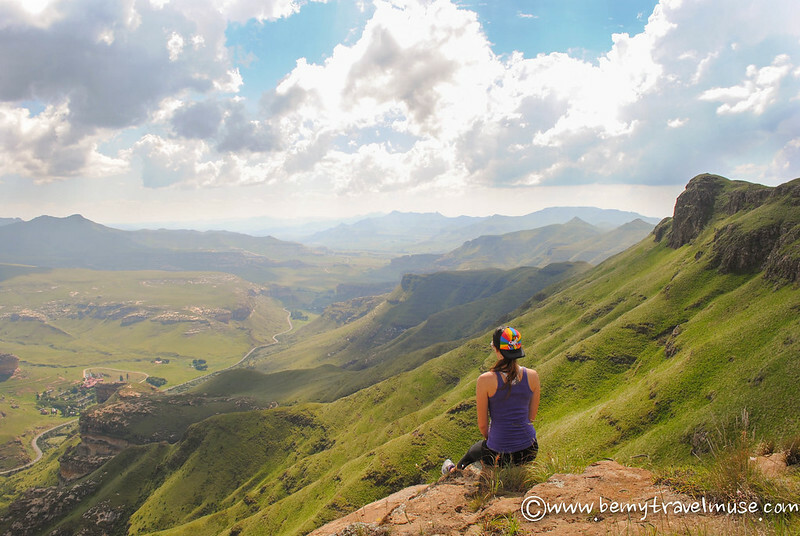 If you could only do one, would you recommend Drakensberg Mts or Golden Gate Highlands? The Golden Gate Highlands hike that I did is doable in an afternoon but most of the Drakensberg will take longer, so I’d decide based on how tight your schedule is. One bonus was there was nobody at Golden Gate and tons of wildlife. Enjoyed reading your post (along with all the comments) My husband and I are planning a 45 day road trip in SA. In your opinion, would this be an appropriate route for us? We appreciate any help/advice you have to offer since we have absolutely no experience in this part of the world. You should definitely also include the coastline from Mozambique as I’ve heard excellent things. The west coast is also supposed to be nice and you can spend more time in the Karoo as well. This is just opinion, but I would prioritize the Eastern Cape and those coasts over the Western Cape. More nature and it’s the path less taken. That sounds like such a wonderful trip, enjoy it and if you discover anything not on this itinerary that’s amazing please let me know. It’s my favorite country and I’ll be coming back soon. Hello Kristin! Thank you so much for the amazing post! I’m so inspired that wet decided to do it too! We are thinking to rent a car from jnb, is the cheapest mini car would be ok to drive all the way? Or do I need to rent something like a truck? What did you drive and which company did you use? Did you take full cover insurance from car rental? Awesome! I had a small volkswagon both times I rented a car there and it’s mostly fine. Some of the roles are really full of potholes so just be careful when you drive. Take the full insurance and actually I always rent from someone different. I just pick whoever is cheapest or happens to have cars! I will definitely do this trip one day, probably starting from Mozambique. I did go to Durban but I missed the coast from there to Mozambique and I KNOW that I missed out! I want to go back sometime in early 2017 I think. want to hook up with other travelers in south africa…. Every summer I travel to third world countries for volunteering. Ghana, Zambia, Malawi, Bolivia. This christmas will be my first ‘holiday’ in years and I decided to go to South Africa. I will fly with a good friend to Joburg to spend christmas. We would love to drive along the Garden Route and go to Cape Town. Where do you think we can start our trip by car after Joburg? I really like your blog and I think we will sleep at the Wild lodge as you wrote. I did mine right from Joburg. Get the car there and head down to the Drakensberg and work your way down the wild coast. It is honestly so much better than the garden route, IMHO. This looks amazing!! I’m thinking about doing something very similar, so this is super helpful. What kind of car would you recommend driving? I just rented a basic VW – the cheapest they had. It was fine! There are tons of potholes but we survived. Yay so glad to provide inspiration! I called the hostels the day before I arrived. For dorms this was usually fine but if you want private rooms you do need to book much farther in advance. You can also bring a tent and camp at all of these places. We spent 3 months last year in the Western Cape and absolutely fell in love with South Africa. We want to come back and explore the northern part of the country, so I was curious about your mention of Golden Gate Highlands National Park and the Drakensberg (there’s also Kruger National Park and Blyde River Canyon which are worth seeing in that area). So much incredible national beauty in South Africa (and you also mention Lesotho which have heard good things about). and definitely hit the coast apart from the western cape! You have posted an excellent article. I was born in S. Africa and grew up right next to the Drakensberg. We left 21 years ago, supposedly for 5 years and never returned, due to our children settling down and now live in Scotland. Your article is very accurate and I can recommend any who read it to consider and visit some of these. Ideal places to enjoy the beauty and recharge out of the rat race. Thank you. This looks amazing Kristin! Definitely taking lots of inspiration from this for my trip in December. I only have a week or so to play with. Do you think this is enough time to get from CT to Joburg? That’ll be quite a rush. I would pick a smaller area to explore, and for me it would be the wild coast, but most people would probably pick Cape Town and the garden route. Though that area is beautiful too, it reminds me so much of Europe and not that much of Africa. Thanks for your reply Kristin. We’re actually spending a full 3 weeks in South Africa and have 10 days for the road trip. Hoping that will be enough but might have to omit the Karoo sadly as we’re aiming to make it all the way to Nelspruit. Did you have trouble with mobile signal whilst you were on the road? What did you use for navigation? Just maps/phone or did you pay extra for sat-nav in the car? We used Google maps and as long as you are connected when you plot the route, it follows you via satellite so you should be OK. You can also download offline maps with Gaia maps or maps.me. They’re not always totally perfect but I find they are helpful as long as you cross reference and make sure it’s accurate. I did it in ten days as well and the Karoo was something I went back and visited later. Hey! 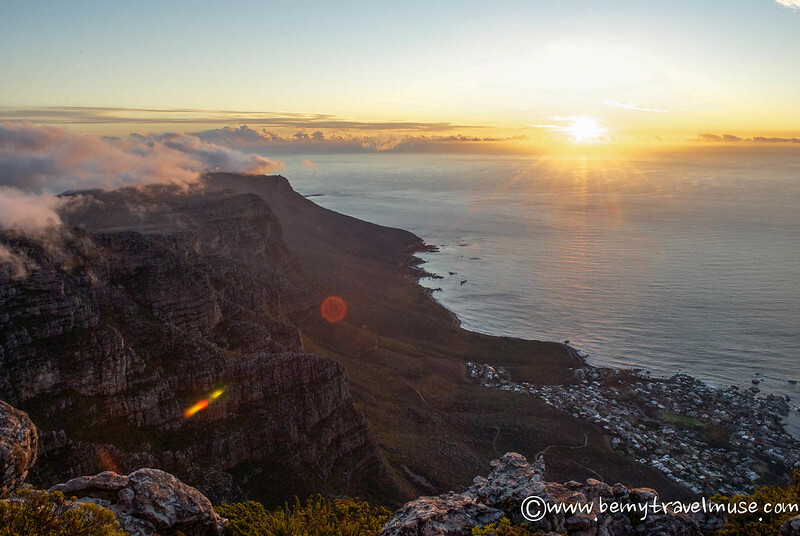 Great blog and great information about South Africa! I’m doing a full month long road trip and I’m particularly interested about your experience driving through the Transkei. I’ve heard bad stories about driving through some of the smaller towns in the area and I really want to know how you found it and if you have any advice for service stops and toilet breaks on the journey. That’s my hands-down favorite part of South Africa! What did you hear? You mean about the road conditions? Yes there are a lot of potholes, so watch out for those. I loved Cintsa, Coffee Bay, Mdumbi, oh man the list goes on! Hey Kristin – Great blog post. Loved your story telling style! I am planning to travel with my wife and 2 kids (9&6) and we will be following the same route as you but backwards from cape town to J’bg! We included stops on coffee bay and Drakensberg after seeing your post. Do you have any tips on what not to do when traveling with kids on the roadtrip? your suggestions will be very valuable. Also tell me if it will be ok to hike with kids for 4-5hrs on the Drakensberg mountains! Hi Suresh, I honestly don’t know what it’s like traveling with kids so it’s really hard for me to judge what’s appropriate or not! Sorry wish I could be more helpful. Hi Kristen! Love your blog/insta so much! Was so useful for planning my Patagonia trip last year and looks like it will be just as useful for South Africa!! I know there are some comments above about the timing of this road trip, but I have just less than 4 weeks’ holidays and am hoping for your thoughts on whether you think this would be appropriate: 2 weeks for the road trip above, another 5 or 6 days for the Cape Town region, around 3 days to go up and see Victoria Falls, and then back for a 3 night safari in Kruger (doing this at the end as it will be April and therefore apparently more chance of seeing wildlife than in March). Originally I wanted to fit a week camping in Botswana in before Victoria Falls but am thinking if I try to squeeze it all in I won’t be doing South Africa justice! Hey Jas, I think that sounds good. However, how are you planning on getting to Vic Falls? Are you flying? Overland travel in Africa once you get out of South Africa can be painfully slow. Hey Kristin, Nice to see your post..specially at the time when I am planning to make a similar road trip in mid of this year. Just wanted to confirm if its really worth & safe for a ROAD trip with a 10 year old kid & an infant. We (my wife & I) are planning to hire an XUV from Johannesburg till Cape town. I am more concern about safety. It’s not the safest country that’s for sure. There are car jackings and break ins in the big cities. Always keep your doors locked and never leave anything visible on the seats, even cheap sunglasses. It can encourage break ins. You just have to be very careful there, sadly, but it’s a fantastic trip and I’d do it again, even solo. Hi! I recently found your blog as I was doing my own research while planning a trip to South Africa. Many other travelers, including you, have suggested to rent a car when exploring SA. Do you mind giving more details about this? Was it easy to rent the car at the airport? What type of paperwork or identification did they need? How much was it? How was driving in another country and on the left side? Do you have any other tips for someone’s first time doing a road trip in another country? I have traveled 6 months in Europe and just utilized uber and public transportation, so this would be a first for me! Hi Rachel, it’s easy to book ahead of time on Expedia or directly with an agency like Hertz or whoever you like to use! They need the same things you need to pick up a car domestically, like your license and passport. You can just walk up to the airport and try to get one, which I’ve done in Johannesburg before, but if you book ahead of time then you know for sure you can get one. I don’t have a hard time on the left anymore, but it was weird at first. Just be aware that you’ll probably hug the right side of the lane more than you should, since that’s what we’re used to, and always check your mirrors to make sure you’re in your lane. Give it extra thought when turning and follow the cars in front of you. I found driving in South Africa to be pretty easy and laid back. Have fun! This looks AMAZING! South Africa is on my list of places to visit, I have fallen in love with it.